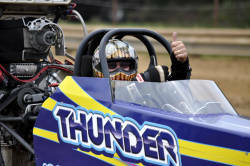 NSDN is saddened to report the passing of longtime Oklahoma sand drag racer Rod Trower. Rod passed on Thursday morning after a lengthy battle with Cancer. Trower was well known in the sand drag community as he raced across the country from Michigan to California in a variety of sand drag vehicles ranging from a series of Turbocharged 4 & 6-cylinder entries all the way up to his trademark “Thunder” Top Alcohol Dragster. 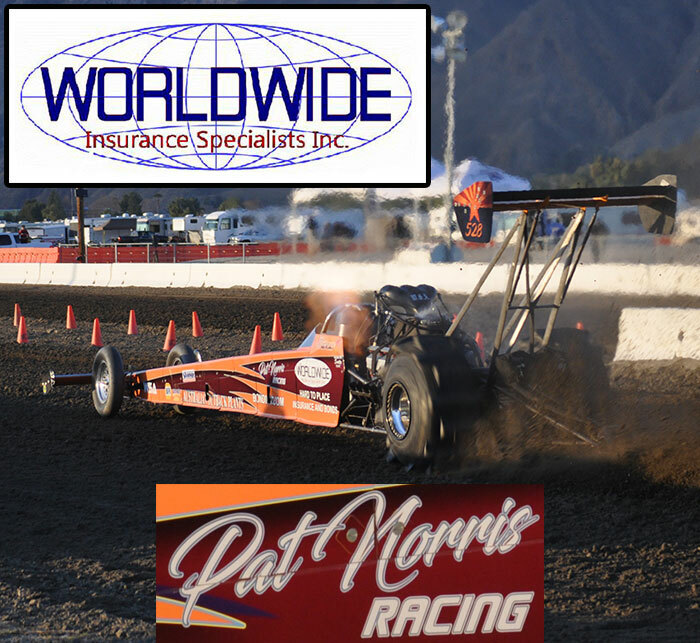 Rod recorded his quickest pass ever with the TA Dragster at Dome Valley, AZ this year in January recording a 2.422 / 145MPH blast. Rod’s wife Dee always raced alongside of him with highly competitive cars of her own, the Trower Racing team was always a threat to win on any given race day all while have fun at the races. We will always remember Rod’s upbeat nature, his love of the sport, and that trademark grin he flashed. NSDN sends our condolences to the Trower Racing Family & Friends. Click "Read More" to view some great photos of Rod throughout the years of sand drag racing. 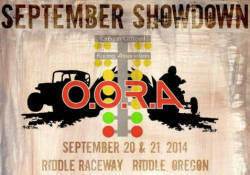 The Oregon Off-Road Association (OORA) is hosting their September Showdown Season Finale on September 20-21 at Riddle Raceway in Riddle, OR. They will be racing a full schedule of bracket classes both days as their points championships will be decided this weekend. Read on to view the event flyer & weekend race schedule. The Pro Truck Nationals (PTN) Sand Drag Racing Series is heading to Grayson, KY on September 11-13 for PTN Championship Weekend 2014. This event features the only Pro Truck class in the Midwest in 2014, and also will crown a class champion over two nights of racing. For the first time at Little Sandy, the Pro Sand Drags Association (PSDA) Heads-Up ATV classes will be in competition. See who the quickest and fastest ATV’s in the world will be on this weekend. There will also be a full slate of Car and ATV bracket racing throughout the weekend with plenty of hardware and money on the line. NSDN will be on-site with coverage all weekend. Check the links below for full event info. 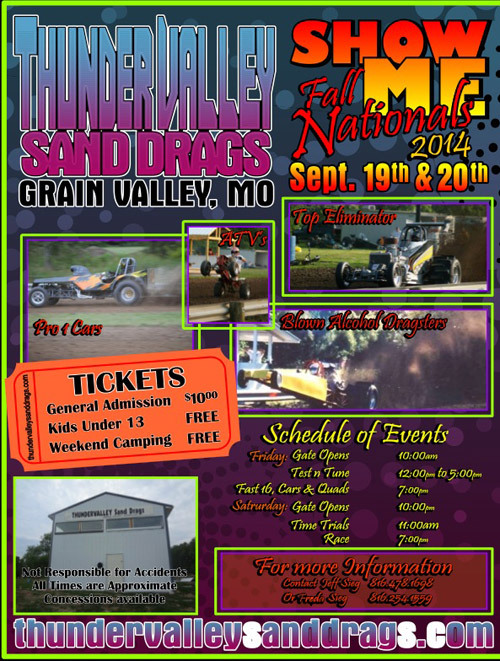 Thunder Valley Sand Drags in Grain Valley, MO is presenting the Show-Me Fall Nationals on September 19-20. This Kansas City-area track is well known for a fast race track and tough competition. This year’s Fall Nationals will feature Top Alcohol & Top Eliminator classes as well as a full slate of Car and ATV bracket classes. Read on to view full info regarding this upcoming event. 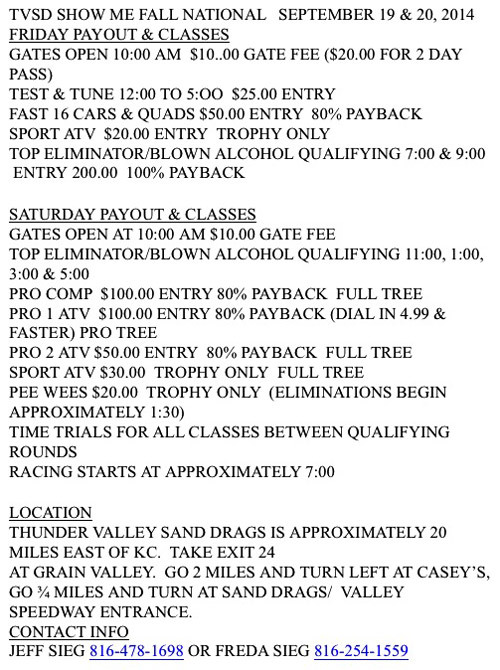 Kingman Sand Drags in Kingman, AZ will be hosting their first event of the Fall on September 27-28. Fast Track Racing will present their normal sand drag event with a full complement of classes at the Arizona Route 66 Motorsports Park. There will also be Mud Bogs & Tough Truck competition taking place at this event. Click “Read More” to view the flyer for this event. Albany Sand Drags in Albany, OR was the site of Sandstorm 2014. This 2nd Annual event is a highlight race for the Northwest sand drag racing season. Racers from Oregon and Washington came out in big numbers to combine with some of the travelers from California and Arizona for an entry total of just over 250 for the weekend. There were plenty of stories throughout the weekend. Let’s take a look at the action. We met Jeff Tomlin of Tomlin Racing Photography at the PTN East Coast Nationals at Newtown Dragway in Newtown, VA back in July. Jeff is not only a talented photographer, but a huge supporter of the sport. Living in Virginia, Jeff and his son Jesse attend a wide variety of sand and dirt drag events in their area, including some wild Top Fuel Motorcycle action. Here’s the first batch of photos and info sent us from August events in his region.